Ask any little girl what they want to be when they grow up and you may hear things like, princess, ballerina, pop star, or dolphin trainer. But scientist? You bet! More and more young girls are looking to science and technology with intrigue and excitement thanks to many brilliant women who are leading the charge and breaking ground in fields that have historically been dominated by men. At LGC, we are extremely lucky to be surrounded by smart, trailblazing, ambitious women who are striving to help make our world a better place each and every day. To celebrate Women’s History month, we sat down with application scientist Erin Steer, senior scientist Dusty Vyas and senior scientist Marcela Soruco to discuss what originally drew them to science and what inspires them today. When did you first become interested in science? What got you involved in it? 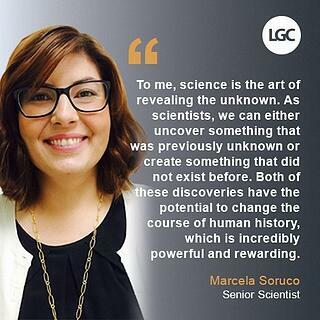 Marcela: I have always been interested in science, it was my favourite subject in school. The first time I knew I wanted to work in a lab when I grew up was when I was 12 or 13 years old and visited a large scale state of the art laboratory in Berkeley, CA where my aunt who is a physicist worked at the time. We toured huge bioreactors, autoclaves and robotics and I remember thinking that I want to work in a place just like that someday. Erin: I had a couple of great teachers in high school that helped to cultivate curiosity. They made science interactive, and provided opportunities to explore topics that were of particular interest. Dusty: When I was seven years old I watched a show called “Life on Earth”. It talked about plant biology and diversity, it blew my mind! With all the famine, starvation and death that were happening in the world at the same time, I knew I wanted to produce plants that would help feed people. I wanted to learn all about applied sciences – how I could take science and apply it to the real world and solve problems with it. What work do you focus on? M: My work focuses on short synthetic pieces of DNA called oligonucleotides which are sometimes labeled with fluorescent modifications. These are used to quantify RNA and characterize DNA in varying cell types. This work is able to support research and discovery in human disease, agriculture and development. E: Right now, I get to focus on other people’s work. 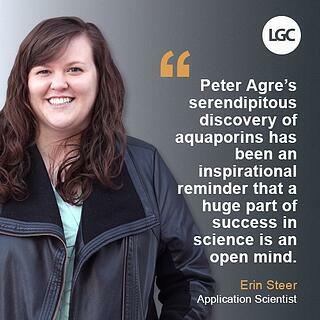 I listen to other scientists describe what is holding them back, and help to identify ways that LGC can help. D: My work is to focus on translating our technologies to breeders and take what breeders across the globe need and translate that back to LGC so we can develop solutions for them. M: So many scientists inspire me –especially female scientist who were pioneers in their fields like Ada Lovelace, Marie Curie, Rosalind Franklin, Barbara McClintock and Jennifer Doudna. E: Barbara McClintock, who discovered chromosomal recombination and transposable elements when she was studying maize genetics. Initially, the importance of her discoveries were vastly underappreciated, but her contributions were compared to those of Gregor Mendel when she accepted the Nobel Prize in 1983. I had the opportunity to listen to Peter Agre speak about his “accidental” discovery of a family of proteins known as aquaporins, channels allow water to pass through cellular membranes. I’m sure he didn’t give himself enough credit, but his story has been a great reminder to me that a huge part of success in science is an open mind. D: Howard Yano-Shapiro – his understanding and how he’s used his influence to make the cacao genome publicly available is absolutely amazing, this allows small holder farmers to have the benefit of technologies such as KASP genotyping to ensure they can produce enough to consistently feed their families. Allen Van Deynze, is a person who wants to find solutions, and he understands the issues – that inspires me. Rita Mumm is a role model for me, totally inspirational. These are the people that understand the issues, and realize that we need to wake up and how important science and education is, and that we need it to fix things and prepare for the next 30 years, now. What does science mean to you today? M: To me, science is the art of revealing the unknown. As scientists, we can either uncover something that was previously unknown or create something that did not exist before. Both of these discoveries have the potential to change the course of human history, which is incredibly powerful and rewarding. To me, science is the perfect combination of creativity and analytical thinking and is a very fun way to work and solve problems. E: This is going to sound SUPER cheesy, but to me, science is a method for understanding the world that gives us insight into how and what we can change (hopefully for the better). The most exciting part about science, is that we are constantly developing new approaches and technologies that allow us to ask questions we didn’t even know we had 50 years ago. 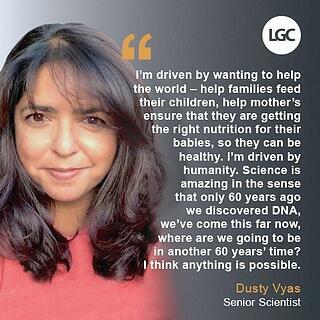 D: Science is a way to help the world, it helps families feed their children, it helps mothers get the right nutrition to nourish their babies. We only discovered DNA 60 years ago, and look how far we’ve come now! Just think where the next 60 years can take us. More than ever before, today we celebrate and thank these women and all the women both here at LGC and across the world who are stepping up to the plate and bringing science to the next levels. Who knows, maybe today’s young girls at home watching “Planet Earth” or “Life” on Netflix, just like Dusty, will be the next ones to follow in her footsteps and continue to lead the way to future innovations and discovery.